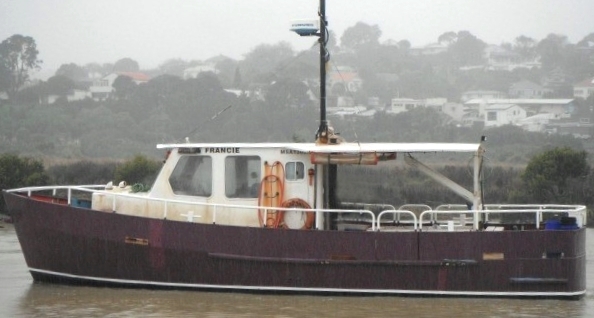 On 26 November 2016 the commercial passenger fishing charter vessel Francie was operating a charter out of Kaipara Harbour with the skipper and 10 passengers on board. The skipper decided to cross the Kaipara Harbour bar and fish in an area of deeper water off the coast. By the time the Francie attempted to re-enter Kaipara Harbour, a forecast developing swell and the influence of an ebbing tide had caused the waves over the Kaipara Harbour bar to increase in height, steepen and break from several directions. The Francie was struck from behind by a large breaking wave, then capsized and sank. Eight of the 11 people on board died. Only three people were wearing lifejackets when the Francie capsized. The Transport Accident Investigation Commission (Commission) found that the conditions on the Kaipara Harbour bar when the Francie attempted to return were predictably unsuitable for the Francie to cross, and indications were that the skipper had a propensity for crossing the Kaipara Harbour bar in adverse conditions. The Commission also found that it is virtually certain that everyone on board would have had a better chance of survival if they had been wearing a lifejacket, and virtually certain that more people would have survived had those lifejackets been fitted with crotch straps. The Commission noted that people have a low appreciation of the importance of wearing lifejackets that are well fitted and of types appropriate to the locations and conditions where they will be used. - there are indications that people may not have a sufficient understanding of the design and capability of the various types of lifejacket available, or of the importance of wearing a lifejacket of the correct size and type for any situation where there is a risk of people ending up in the water. The Commission made four recommendations to Maritime New Zealand to address these issues and noted the actions already being taken to address one of the safety issues. - if a person has concerns about the safety of any maritime activity, they should not hesitate to report them to the appropriate maritime regulator. This could help prevent accidents and save lives in.